Tim Beatley has long been a leader in advocating for the "greening" of cities. But too often, he notes, urban greening efforts focus on everything except nature, emphasizing such elements as public transit, renewable energy production, and energy efficient building systems. While these are important aspects of reimagining urban living, they are not enough, says Beatley. We must remember that human beings have an innate need to connect with the natural world (the biophilia hypothesis). And any vision of a sustainable urban future must place its focus squarely on nature, on the presence, conservation, and celebration of the actual green features and natural life forms. A biophilic city is more than simply a biodiverse city, says Beatley. It is a place that learns from nature and emulates natural systems, incorporates natural forms and images into its buildings and cityscapes, and designs and plans in conjunction with nature. A biophilic city cherishes the natural features that already exist but also works to restore and repair what has been lost or degraded. 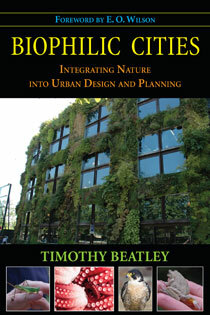 In Biophilic Cities Beatley not only outlines the essential elements of a biophilic city, but provides examples and stories about cities that have successfully integrated biophilic elements--from the building to the regional level--around the world. From urban ecological networks and connected systems of urban greenspace, to green rooftops and green walls and sidewalk gardens, Beatley reviews the emerging practice of biophilic urban design and planning, and tells many compelling stories of individuals and groups working hard to transform cities from grey and lifeless to green and biodiverse. "Because of his great vision, Tim Beatley is a hero to many of us. To paraphrase a famous quote, some people see cities as they are and ask why; Tim Beatley sees cities as they could be (filled with nature) and says why not?" Richard Louv, author of "Last Child in the Woods: Saving Our Children from Nature-Deficit Disorder"
"This outstanding and important book provides inspiration and practical guidance for addressing the basic human need for nature in a rapidly urbanizing world, authored by one of the world's great authorities on harmonizing nature and humanity in cities today." "The future of our species depends on our ability to coexist with the natural world. But what does this actually mean for human settlements? Biophilic Cities makes the case for why nature is so vital to the human experience, and how urban planning and design can harness our affinities with nature to create more sustainable cities. It is a must-read for anyone interested in the future of cities." "Presenting both conceptual overviews and practical advice, the work tackles building, site, and community-level planning and goes beyond the now-familiar tenets of 'green building' to advocate for an ecosystem wide vision for habitat conservation, restoration and construction....This work is appropriate for college-level planning and design students but will also be of interest to environmental activists and green construction practitioners." "Makes a compelling case for including more nature in our cities…Tremendously educational and provides the reader with a delightful new perspective to re-explore their surroundings." "...Biophilic Cities provides a convincing argument for integrating 'nature' into cities...the book is excellent at bringing together environment-behavior studies and summarizing the latest in environmental-psychology research." "This book expresses the credo of a very dedicated author who sees great merits in re-introducing nature into cities and urban culture." Chapter 3. Biophilic Cities: What Are They?